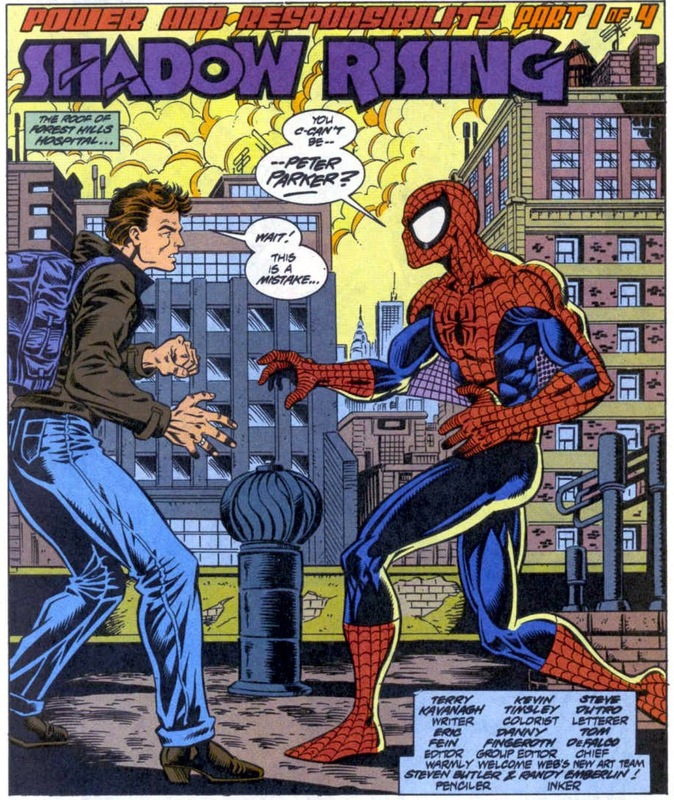 Many fans and critics cite the “Clone Saga” as one of the worst Spidey storylines of all time, I even wrote a post in my first year of running Chasing Amazing were I blame my first long hiatus from Spider-Man and comics on the overall insufferableness of this never-ending arc. 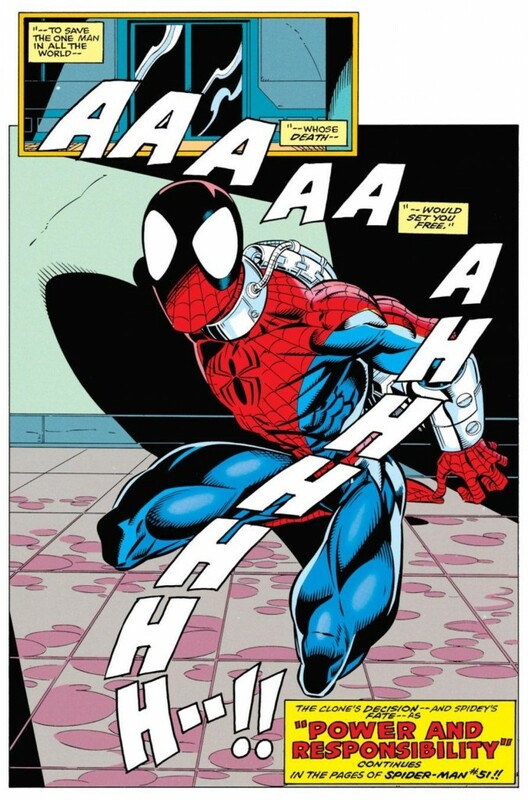 And yet, as time goes on and I find myself reading and re-reading more and more Spider-Man comics for potential inspiration/content for Chasing Amazing, I’ve come to believe (or maybe I’m just deluding myself) that there’s something about the “Clone Saga” that’s misunderstood. It’s unquestionably too long and towards the end of this thing, it gets painfully aimless and unreadable, but it’s also not the crime against humanity that some make it out to be. And when compared to other comics that were released in the mid-1990s, I think the hate the “Clone Saga” receives is actually a little unfair. My opinion on the “Clone Saga” started to very gradually change a little more than a year ago when for the very first installment of the Super Blog Team-Up project I wrote about the “Greatest Responsibility” storyline – where Peter “quits” being Spider-Man and hands the webs over to his clone, Ben Reilly. I hadn’t read these comics since they were first published in the 90s, so when I actually found some redeeming qualities in them, I had to test if it was just a fluke. In anticipation of last year’s Superior Spider-Man/Scarlet Spider team-up, I wrote a post about the “Web of Death” arc where Kaine murders Doc Ock. Not only did I find some okay-ish qualities about that story, I actually quite liked it. That’s when I realized I needed to re-read, or in some instances, read for the first time, every single arc in the “Clone Saga.” I needed to see for myself if my one-time hatred for this thing was being driven by some kind of weird bias I had developed, or because I truly despised it. But since Chasing Amazing is first and foremost a look at my personal relationship with Spider-Man comics, I also had to incorporate the findings of my study into my blog somehow. 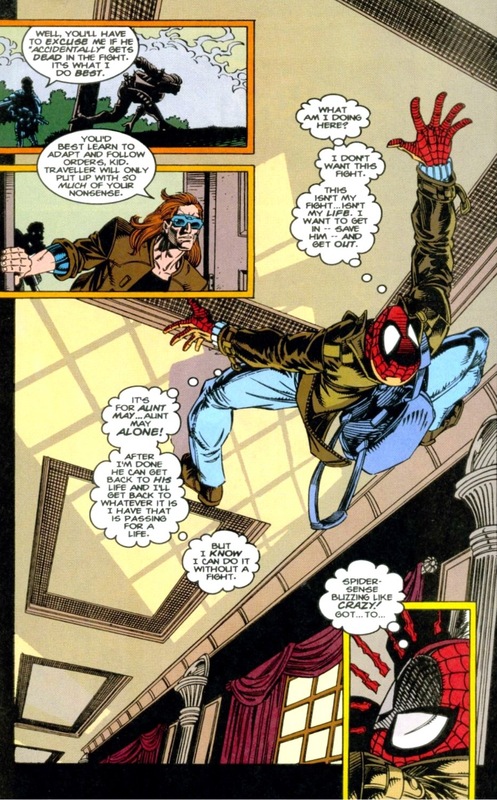 I didn’t want to subject the readers of this site to a steady stream of “Clone Saga” content in risk of alienating some of you, so I thought I would wait until the 20th anniversary in October to kick off a very long-term project. 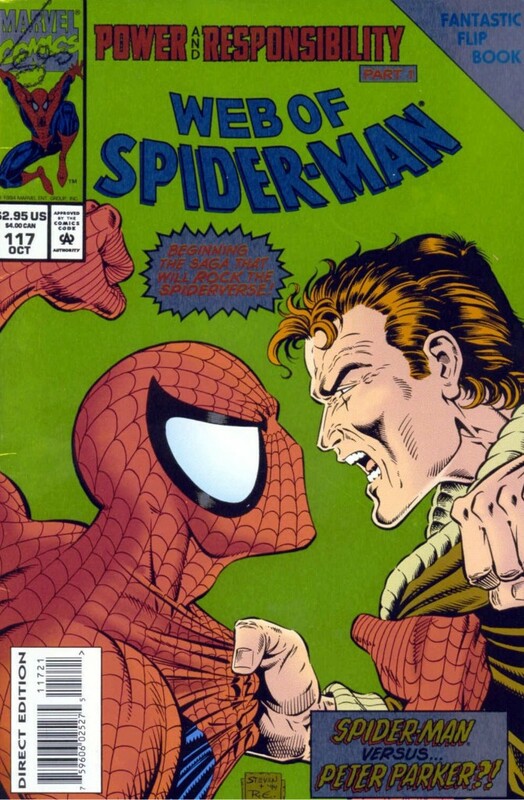 Each month (with a few exceptions), I’m going to write about a select “Clone Saga” storyline from 20 years prior. So next month, I will do a post about the arc from November, 1994, in December, it will be a post about December, 1994, and so on. That way, I get to conduct my personal exercise in a way that won’t completely inundate you with analysis of a storyline must people consider to be garbage. In the months leading up to “Power and Responsibility,” Spider-book readers were being treated to a number of teases involving a mysterious stranger making his way towards New York. 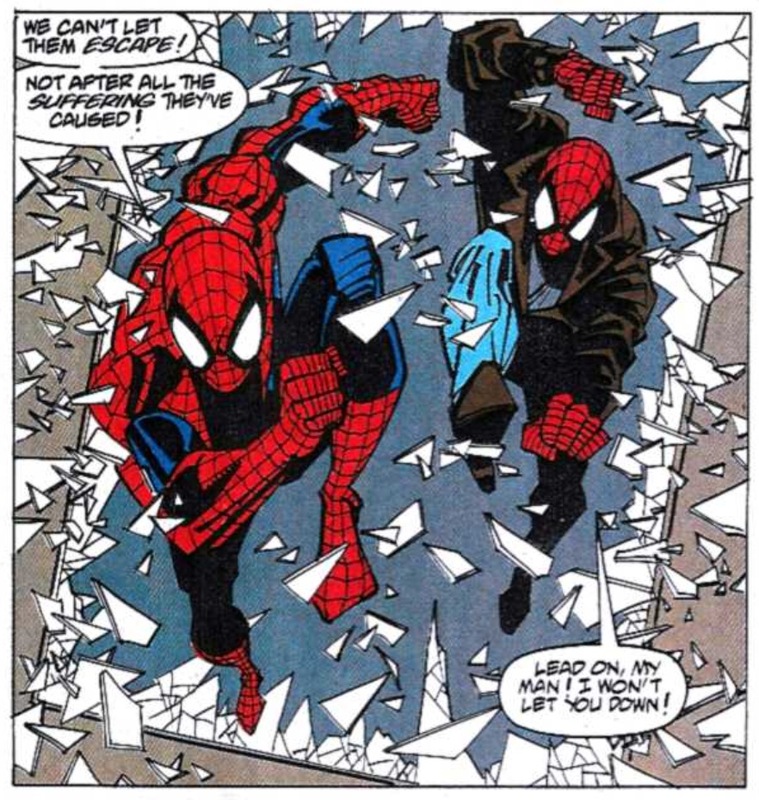 After the mystery man reveals himself to be a doppleganger for Peter Parker on the final page of Spectacular Spider-Man #216, the “Clone Saga” officially kicked off in earnest. “Power and Responsibility” also introduces readers to the very enigmatic villain, Judas Traveller, whose high-minded, philosophical ramblings remind me of the Rust Cohle character from True Detective (“time is a flat circle”). He also seems to have a penchant for taking copious amount of notes. There’s something oddly compelling with Traveller that goes beyond even his extraordinarily cool name (which sounds like something a rock band would call themselves), but in retrospect it’s also difficult not to dismiss him as another straight out of the 1990s anti-hero/villain that is all sizzle and no steak. He’s definitely made out to be very powerful, as he confines Spidey to chains during their first encounter, but his characterization is also all over the map from issue to issue in this arc and what is presented as mysterious, really comes across as frustrating – especially with the hindsight of how Marvel ultimately paid the character off (which is to say, they didn’t). 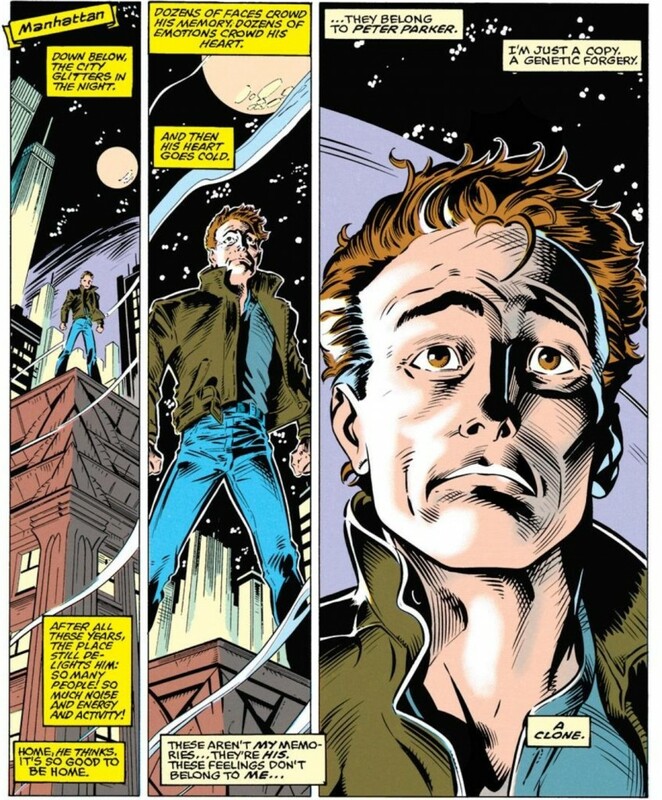 And when you think about it, my issue with Traveller both directly in this one storyline and his long-term usage/payoff encapsulates what is good and bad about the “Clone Saga” as a whole. The saga is undoubtedly at its best at the very beginning (i.e. the first six or seven arcs) before Marvel decided that money could be made by stretching this thing out for more than two years. That’s because the rotating creative teams are much more interested in exploring the characters of the Spider-Verse, rather than coming up with the most outrageous and controversial story they can think of. Peter is in a very dark place when “Power and Responsibility” begins. 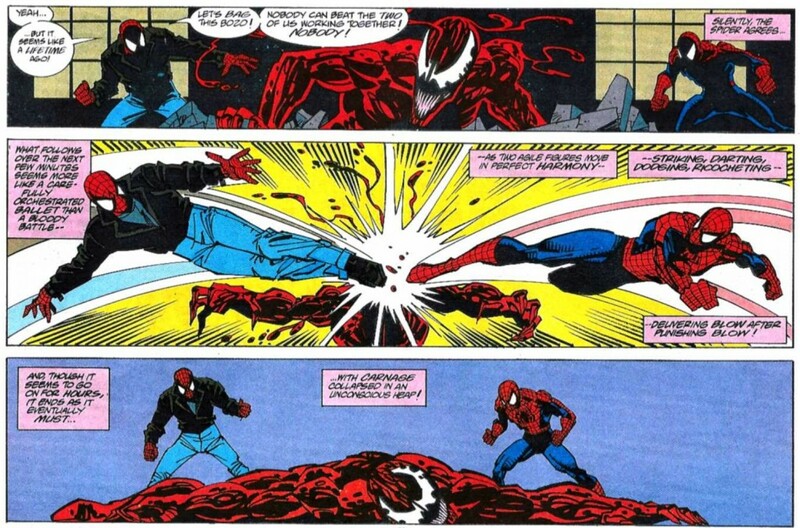 Over the past year and change, he endured “Maximum Carnage” and then the discovery that his back-from-the-dead parents were actually androids deployed by the Chameleon (who was actually working for Harry Osborn’s Green Goblin). In fact, Peter is in such despair, he actually divorces himself from his civilian identity and pledges only to live as Spider-Man going forward, alienating himself from Mary Jane in the process. If that’s not enough lemon juice in the wounds, Aunt May has just suffered a stroke and is in a coma. In short, Spider-Man is in the midst of a very severe and emotionally crippling identity crisis. Therefore, bringing back his thought-to-be-dead clone who was last seen in Spidey comics nearly 20 years earlier, actually makes a whole lot of sense. In terms of trying to tell the most dramatic story possible, what could be worse for a character that is losing himself piece by piece, than to have to face his genetic copy? That’s why, on paper, the “Clone Saga” was such a fascinating story. The Spider-book creative team supposedly loved the idea when it was first brandied around the Marvel back office. And who can blame them? A story that’s this psychological is right in the wheel-house of a J.M. DeMatteis, who not only scripted the Amazing Spider-Man stories, but also wrote some backup stories explaining the origins of Ben (which would eventually feed into the extraordinarily excellent Lost Years miniseries). The art team was also quite good and well-suited for this storyline, with such Spidey icons as Mark Bagley and Sal Buscema. And I’ve always had a huge soft spot for Tom Lyle, who created the Ben Spider-hoodie look. Of course, “Power and Responsibility” does devolve into token 90s silliness. We get a Carnage appearance in this issue because, of course, who else are you going to rope into a mid-90s Spider-Man story. Going back through these issues always reminds me on just how quickly Carnage became overexposed. It gives me an appreciation for how sparingly Marvel uses him today. But for an opening salvo of what would go on to be one of the most talked-about long-term arcs in comic book history, “Power and Responsibility” is effective and lays the groundwork for a story I would want to read about. After reading that last sentence, I hope you all realize how this is going to be a very interesting next few years on Chasing Amazing! Awesome! A great idea. Now that everyone’s had 20 years to calm down, we can revisit this storyline with cooler heads. I recently ammassed the entire Clone Saga (each single issue of the 4 titles, plus special one-shots and so on), in to one short box. I wanted to revisit it and come to peace with it. Turns out you beat me to it. Really looking forward to following your series. I think old fans and new readers alike will find it really useful. I have not read a single issue of the Clone Saga, but now I may have to pick up a few issues. I am curious to learn which issue or arc of this saga caused you to stop buying comics. I guess I will have to read your series to find out. Great post.. Only a sode note.. I allways thought that the Green Goblin behind the android parents was Norman amd not Harry.. Wonderful idea. You can probably look forward to at least a couple of comments thread rants from me during the course of this project. I agree with your initial assessment of the Clone Saga as a mixed bag, although I don’t remember the good stuff as being particularly concentrated at the beginning. The Jackal comes to the fore pretty early IIRC and he’s terribly obnoxious. But we’ll see what you think. Judas Traveller was interesting on the surface, but the problem was that they never went any deeper than surface level with him. The Clone Saga is firmly in my original sweet spot. I love most of the JMD issues and they seem to hold up pretty well today. I missed the ending because I took my comic break around senior year of high school because they weren’t “cool enough”. Should be an interesting monthly experiment. Can’t wait for the Maximum Cloneage thoughts! These issues were actually the first Spider-Man back issues that I bought. At the time I had just started keeping up with Straczynski’s run, which had just wrapped up its first story arc. I found “Power and Responsibility” at a KB Toys, packaged in an action-figure-style box with see-through plastic and stuffed haphazardly between various old coloring books at the back of the store. Somebody had actually torn the box open, and when I went to the counter with it they said I could have it for free. The same went for another box containing the “Exile Returns” storyline. They were all first printings, not reprints, and I’m still a bit puzzled as to why I would have found them packaged together like that in a toy store, some seven years after they were published.